This recipe may look long and involved, as it has three separate components. However, each one by itself is quite simple, and the components can all be made in advance and kept in the refrigerator or freezer until you're ready to bake the bars. In the summer, I love these bars slathered with strawberry jam and in the winter with apple butter. If you don't have the time or ingredients to make those, open up a jar of some other homemade or purchased jam or compote. Rye flour, with its mild, sweet flavor, makes this recipe quite versatile, and it adapts easily to whatever fruit spread you have on hand. Position a rack in the middle of the oven and preheat the oven to 275 degrees. Rub a 9-inch springform pan with butter. Make the shortbread crust: Sift the flours, sugar, and salt into a large bowl, pouring back into the bowl any bits of grain or other ingredients that may remain in the sifter. Add the melted butter and vanilla and stir until thoroughly combined. Using your hands, press the dough evenly into the bottom of the buttered pan. Put the pan in the freezer for 20 minutes while you make the crumble topping. Make the crumble topping: Add all of the crumble ingredients except the melted butter to the bowl of a food processor and process until the oats are partially ground, about 5 seconds. Pour the mixture into a bowl. Add the melted butter and stir with your hands, squeezing the dough as you mix to create small crumbly bits. Set aside. Bake the frozen shortbread until golden brown and firm when touched, 50 to 55 minutes. Remove the shortbread from the oven and increase the temperature to 350 degrees. 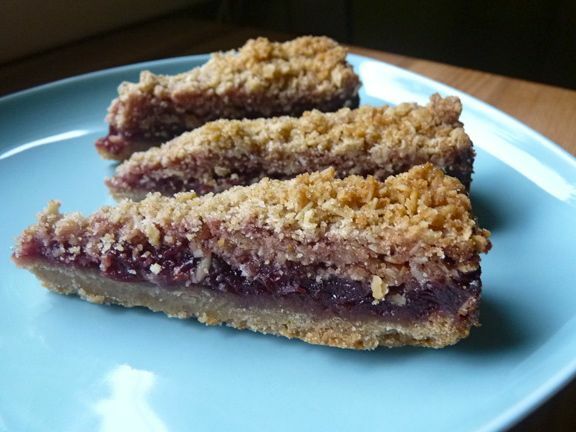 Assemble the crumble bars: Spread 1½ cups jam, fruit butter, or compote over the shortbread crust and top with the crumble, evenly sprinkling bits of it together to create irregular crumbles. Bake the bars for 50 to 55 minutes or until golden brown, rotating the pan halfway through for even baking. When the pan is cool enough to handle but still warm, run a sharp knife around the edge of the crumble bars to loosen any fruit that may have stuck to the pan while baking and remove the ring. Keep the crumble bars in the pan until they are completely cool, then cut them into wedges. These bars are best eaten the day they're made. They'll keep in an airtight container for up to 2 days.